Last updated on 06 May 2018. This document explains what information is collected by James Roberts Fitness. It also explains how we use that information, where we store it and how we protect it. We will not share your information for third party advertising purposes. We explain your rights in relation to the information. We’d also like to remind you that our James Roberts Fitness Terms and Conditions has more information about how we operate the James Roberts Fitness Services. 1.1. Who is James Roberts Fitness? We are James Roberts Fitness, a sole trader company registered in the United Kingdom with Company House. 1.4. What about children? We recognise we have a special obligation to protect personal information obtained from children. We do not and will not knowingly collect personal information from any child under the age of 13 without consent from their parent or guardian. If you are a parent or guardian and are concerned about the transfer of personal information about your child, please contact james@fitamputee.co.uk. 2. WHAT INFORMATION IS COVERED? 2.2. What about the storage of payment details? The processing and storage of payment details is a matter for the relevant platform and payment method/processor. James Roberts Fitness will not receive, process or store any of your payment details. This is because the payment transactions themselves are completed through the relevant platforms (e.g. PayPal) via the personal email address you have associated with that platform account. If you make purchases within the James Roberts Fitness Services, we are notified by the payment processor once a transaction takes place, but we will not receive any of your actual payment details. 3. HOW IS INFORMATION COLLECTED FROM YOU? We will collect information ourselves or via third parties for appropriate matters. How might we collect this information from you? Information may be collected or processed regarding you in the following ways: (a) information you give us via the James Roberts Fitness Services; (b) information is given when you contact us or report a problem with the James Roberts Fitness Services; and (c) we may also ask you to complete surveys that we use for research purposes, although you don’t have to respond to them. We may collect this information via the James Roberts Fitness Services or trusted third parties connected with us for optional things like surveys or polls. 4. WHERE IS YOUR INFORMATION STORED? We will store your information in the European Economic Area. We will do our best to keep this information secure. No information security system is perfect so please remember to be careful. All information we hold is stored on our secure servers (which we own or license from appropriate third parties). We use industry standard procedures and security standards to prevent unauthorised access to our servers, however no online service or website can be completely secure, so please protect the account information in your possession as well. 5. HOW IS YOUR INFORMATION STORED? We will use your information to run, maintain and improve the James Roberts Fitness Services as well as to communicate with you (e.g. with newsletters or emails). Will we ever share any of your information with other parties? We may share some aggregated and general non-personal information on user behaviour (e.g. sales per region) with our partners who work with us to provide the James Roberts Fitness Services to you (for example, with payment providers) in order to support, improve or amend the James Roberts Fitness Services. We may also share non-personal information with data analysis services to help us run the James Roberts Fitness Services. 6. HOW YOU USE YOUR INFORMATION AND THIRD PARTIES? You have the option to share your own personal information with others parties, in which case it will be governed by those parties’ own privacy policies – make sure to take a look at them. 7.1. Please be aware that we are subject to various laws and we may be required to release personal information in order to comply with law enforcement or other legal requirements. You have rights about how your personal information is used, which can vary depending on where you live. If you have any questions, please contact us at james@fitamputee.co.uk. 8.1. Can you ask us to stop processing your personal information? You have the right to ask us not to process your personal information for marketing purposes. You can change your email settings to unsubscribe from email communications. 8.2. Can you see what information we store for you? Depending on where you live, you may have additional privacy rights. For example, in the EU you have the right to access your personal information we possess; you may have the legal right to contact us to request that we delete your personal information from our system, and you may have the legal right to ask us to rectify/correct your personal information if appropriate. We will use commercially reasonable efforts to honour your request, but we may decline requests that are unreasonably repetitive, are disproportionate or infringe the privacy of others. 8.3. Under California law, California residents who have an established business relationship with us have the right to request certain information with respect to the types of personal information we have shared with third parties for their direct marketing purposes, and the identities of those third parties, within the immediately preceding calendar year, subject to certain exceptions. All requests for such information must be in writing which in this case can be submitted to james@fitamputee.co.uk. This same California law permits us to provide you, in response to your written request, with a cost-free means to choose not to have your information shared rather than providing the above-described information. You may exercise that choice by contacting us at the address above. 8.4. Who should you contact if you would like to exercise these rights? If you would like to exercise any of these rights or have any queries regarding them, please contact james@fitamputee.co.uk. 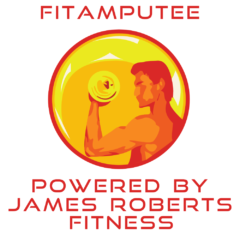 We (meaning James Roberts Fitness) use technologies in our website (www.fitamputee.co.uk), plus all other James Roberts Fitness products and services, including (but not limited to) subscribers, customer support, blogs and social media services (which we’ll call the “Services”) to collect information that helps us improve your online experience. We refer to these technologies, which include cookies, collectively as “cookies.” This policy explains the different types of cookies used on the Services and how you can control them. By accessing or using the Services you authorise us to collect certain technical information in order to (i) analyse usage of the Services; (ii) provide a more personalised experience; and (iii) manage advertising. We, and our third party service providers, may use server log files or web log files and tracking technologies to collect and analyse certain types of technical information, including but not limited to, cookies, IP addresses, device type, device identifiers, browser types, browser language, URLs, domain names, landing pages, game state, the date and time of usage of the Services, and other similar information. We use Facebook’s Custom Audience feature to target users with advertising from time to time. Custom Audiences allow us to target ads to a specific set of people through Facebook. You can manage your privacy settings in the privacy tab of your Facebook account.